The City of Lake Forest Park has a plan to help mitigate traffic safety concerns, address the increase in traffic volume on SR 522/Bothell Way NE, and improve pedestrian safety. 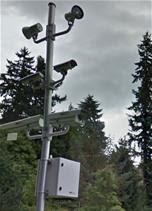 A new traffic safety red light photo enforcement camera is being installed at the intersection of SR 522/Bothell Way NE and SR 104/Ballinger Way. To comply with state law, “Photo Enforcement” signs have been posted in the area. It is anticipated the camera, and enforcement, will go live this summer. An additional announcement will be made prior to the “go live” date. More information about the Traffic Safety Photo Enforcement Program here.